6" hardened and tempered blade with polished finish Wooden handle A smaller version of the br..
7" hardened and tempered blade with polished finish Distinctive rounded tip and V-shaped back b..
11" hardened and tempered blade with polished finish Slightly rounded diamond shape blade with ..
16" hardened and tempered blade with polished finish Rounded bullnose blade with a st.. This sturdy float is a lightweight one-piece polyurethane moulding. The face is for applying pl.. This sturdy float is a lightweight, one-piece polyurethane moulding. The face is for applying p..
280mm x 120mm hardened and tempered blade with polished finish Wooden handle Large rectangula.. 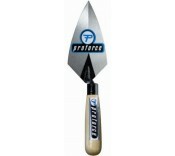 This edging trowel is commonly used to apply a rounded finished edge to concrete and render. Th..
150mm hardened and tempered blade with polished finish Comfortable soft-grip handle Finishing..
180mm hardened and tempered blade with polished finish Distinctive rounded tip and V-shaped bac..
280mm Hardened and tempered blade with polished finish Slightly rounded shape blade with a V-sh..
400mm Hardened and tempered blade with polished finish Pointed tip Comfortable soft-grip hand.. Forged from a single piece of high carbon steel for unsurpassed strength 152mm x 70mm Durasof.. Round ended solid forged blade For mixing/gauging small quantities 175mm x 86mm Durasoft ha.. Forged from a single piece of high carbon steel, then heat treated for strength and durability ..
Square End Marshalltown Magnesium Float Made from very hard, durable and lighweight magnesium (..
Gold stainless steel blade Aluminium alloy Xtralite mounting is lightweight but very strong B.. Stainless steel construction For finishing drywall corners For use with plaster Durasoft ha..
Durasoft Handle Scored blade Callous preventer Aluminium blade 325mm x 325mm ..